Mahavishnu Orchestra is in the pantheon of jazz fusion pioneers replete with black hole density, volcanic intensity and ridiculous virtuosity. I had never heard anything quite like John McLaughlin’s searing fretwork, Jan Hammer’s prog-funk sounds and Jerry Goodman’s violin thrown to the front of what truly seemed to be an inner mounting flame. Not for the faint of heart. Beneath it all was drummer Billy Cobham, who played at Mach tempos and time signatures with the necessary muscle to stir the mix. While Mahavishnu (especially in its original lineup for three brilliant albums) occasionally slowed down, more often than not, there were an avalanche of notes and spaces were usually avoided. The influence of McLaughlin’s Eastern spiritualism was very much present and the music omni-powerful. After Mahavishnu, McLaughlin turned away from the fire and the volume way down with his acoustic Indian trio Shakti, Jan Hammer went on to Miami Vice fame and blazed rock fusion territory with Jeff Beck, and Billy Cobham recorded his first solo album, 1973’s Spectrum. Cobham brought along Hammer, session master Leland Sklar on bass and guitarist Tommy Bolin (all of 21, before he went on to play with the James Gang and Deep Purple), as well as the great Ron Carter on acoustic bass and Joe Farrell on reeds/winds. A mix of funk and fusion, Hammer’s trademark mini-moog squelches and electric piano, Bolin’s cross-over agility, and Cobham’s furious chops placed up front, in the middle and sideways, Spectrum stands on its own as one of the seminal albums of its genre. Opening with a stampede of toms (“Quadrant 4”) and closing with Crusaders like funk (“Red Baron”), the album still holds up, even 40 years later. 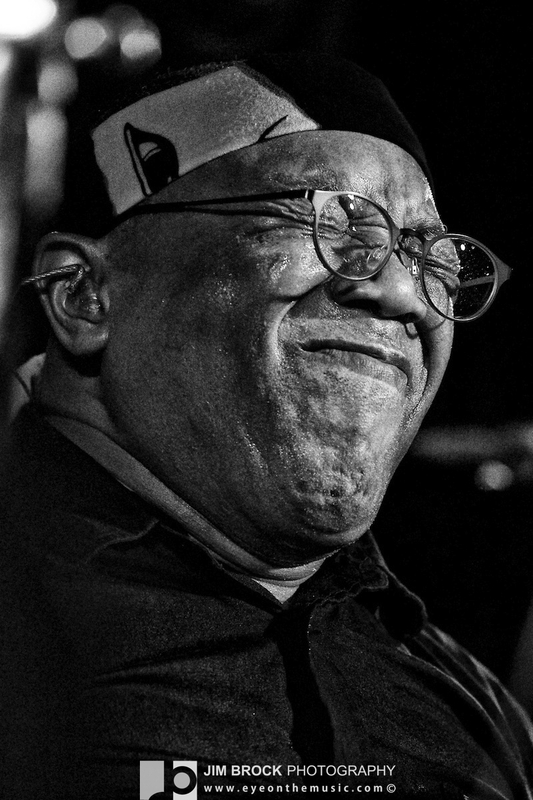 Cobham has been recording at a Woody Allen-esque pace over the years, with over 40 albums under his own name and a resume that includes Miles, Sonny Rollins, Horace Silver, Quincy Jones, McCoy Tyner and other jazz luminaries too numerous to mention (I’m partial to 1976’s The Billy Cobham – George Duke Band: Live on Tour in Europe, with John Scofield and Alfonso Johnson). Looking back on where it started seems appropriate. To say Cobham is almost machine-like in his playing is more a testament to his strength and precision than a description of his breakneck pacing and explosive fills. In fact, on more recent listening, it is Cobham’s snare that is the constant. Always bubbling and percolating under whatever he is playing. While his double kick drum set up is rock in posture, it should not be taken as a jazz equivalent of Spinal Tap. Far from it (though I was curious how his traditionally monster kit plus band would fit on the snug Mint stage). 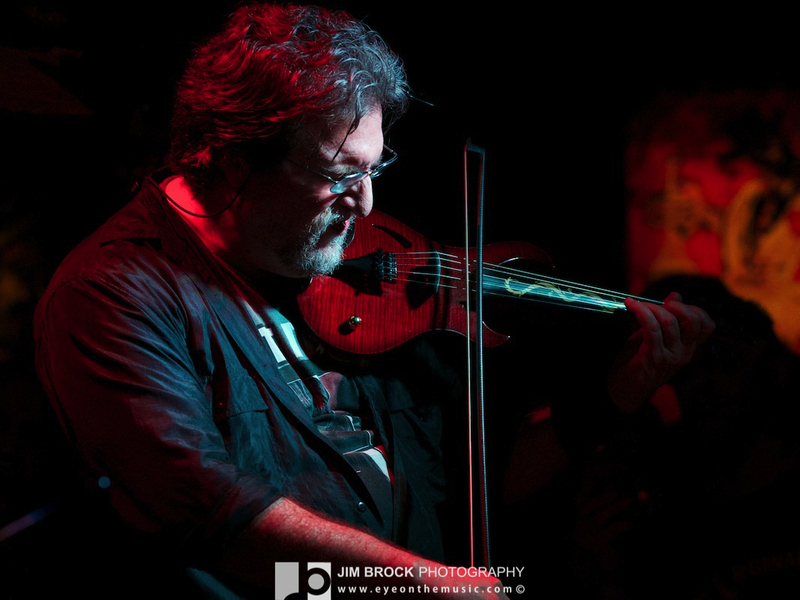 The Spectrum 40 tour reunites Cobham with Mahavishnu violinist Jerry Goodman, with Cobham vets Dean Brown on guitar, Gary Husband on keys and Ric Fierabracci on bass. The tour had been in the Northeast and followed that up with West Coast dates in L.A, Santa Cruz and Oakland. Beginning with a snare roll that barreled into the theme of “Mushu Creole Blues” (from 1994’s The Traveller), the Spectrum unit started to swing quickly as Goodman and Brown enthusiastically tangled with each other. Husband’s topically named “If the Animals Had Guns, Too” (from his 2012 release, Dirty & Beautiful, Volume 2) went to darker, freer corners in a more compact tune. Husband is an exceptional drummer in his own right, which must bring added intuition to his keyboard interplay with the bandleader. Cobham was relaxed and loose with the crowd as he introduced the band, admittedly a bit “fuzzy” after their escape from New York, just before a Nor’easter shut down travel. After the intros, the band jumped into Dean Brown’s “Two Numbers”, which found an interesting African marimba like feel at its mid-point. An extended Cobham solo stitched rhythmic fits and starts into a locomotive, mixing sheets of tom fills with his snare and cymbals, drawing the snare down to the barest paradiddle before an inundating flurry of strikes that launched “Stratus” (from the original “Spectrum” album and a fusion “greatest hit”, deservedly so). This being the first time I saw Cobham live, I was struck by how he played such a large kit (2 kicks, 2 floors, 4 rails and enough metal to melt into a car) like one half its size. That’s finesse. The second set began with Goodman’s “Brick Chicken” (from 1999’s, Stranger’s Hand, a collaboration of Goodman, harmonica player Howard Levy, drummer Steve Smith and bassist Oteil Burbridge), and a flat out boogie that wouldn’t be out of place as a jam band crowd pleaser. “Fragolino” and Ric Fierabracci’s “Sphere of Influence” (from 2007’s Made in Australia with Frank Gambale and Virgil Donati) brought some (relatively) gentler passages between feverish highs. The set closed on the heels of another Cobham solo with “Quadrant 4” off Spectrum, a total stomp with rock hero sensibilities and a 405 pileup of a crescendo. “Red Baron” had to be the encore (which also appropriately closes Spectrum), the band returning to its feel good theme many times over and leaving the stage to a very happy and appreciative audience. This was an outstanding night of music and the material a worthy revisit 40 years later. A special shout out to The Mint. The Spectrum 40 show was the second KJAZZ sponsored event at the venue in a week (following Joe Lovano and the US 5 with Esperanza Spalding), and if these shows are any example, the versatile booking of The Mint is a welcome and vibrant addition to the Los Angeles jazz scene. The room is a not a traditional clinking glasses, hushed at your seat jazz club. It is informal, open and intimate (but be prepared to stand). With Stanley Clarke leading his band through a three date run across town, not a bad week for Los Angeles jazz either. 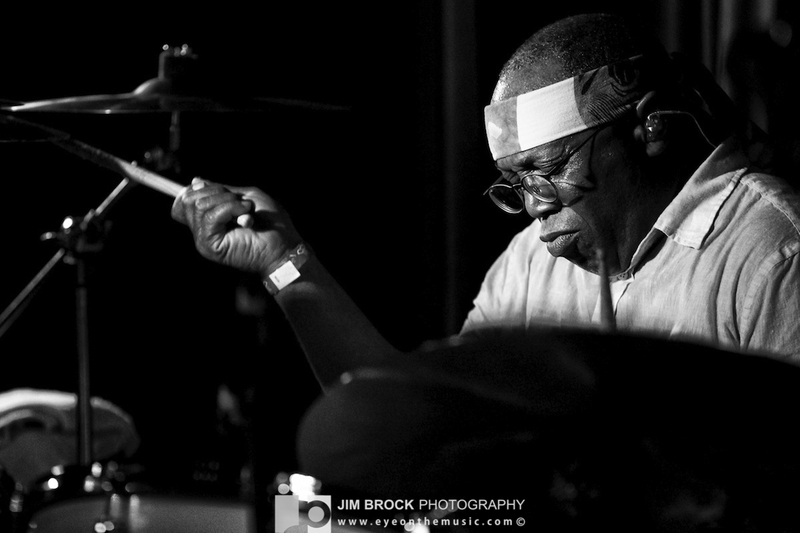 Also, check out this recent interview with Billy Cobham talking about the tour and the band. Good stuff.